PALM SPRINGS, CA (August 23, 2017) On Saturday, October 21 over 2,000 community members will unite in Ruth Hardy Park to walk in the 31st Desert AIDS Walk in support of Desert AIDS Project, presented by Desert Regional Medical Center. 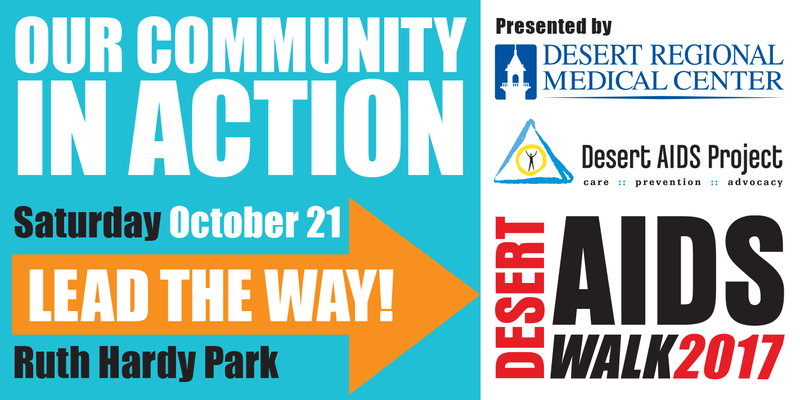 This years walk, with the theme of ‘Our Community In Action’, will follow a 2.5-mile route through downtown Palm Springs and is notable for the diversity of community members who come together as teams each year to support Desert AIDS Project and our twelve community partners. Desert AIDS Walk 2017 begins at 8 am and will feature live entertainment, a Health & Wellness Festival featuring over 40 vendor booths, and a kid’s activity zone. Desert AIDS Project CEO, David Brinkman is expected to update the community on the progress D.A.P. has made in eliminating HIV/AIDS and the work that remains to be done to ensure community health becomes a reality for every resident of the Coachella Valley. 10:30 Walkers return to Ruth Hardy Park \ Health & Wellness Festival Continues \ LIVE Entertainment \ Complimentary lunch and snacks courtesy of multiple sponsors. Presented by Desert Regional Medical Center. Other Sponsors include: Revivals Stores, Jus Chillin, Koffi, VIP Mobile Suites, The Standard Magazine, Gay Desert Guide, and CV Independent.